Hands-Only CPR Can Save Lives! More than 1,000 people suffer non-traumatic cardiac arrest outside hospitals — including about 26 children — each day in the U.S. Only 46% of those get the immediate help that they need before professional help arrives. CPR, especially if performed immediately, can double or triple a cardiac arrest victim’s chance of survival. 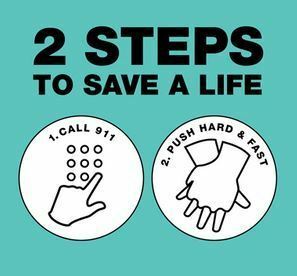 There are two important steps you can learn and take to save a life. During CPR, you should push on the chest at a rate of 100-120 compressions per minute. Don’t know what 100-120 beats per minute feels like? Try singing “Stayin’ Alive” by the BeeGees. Research has shown that people are more likely to remember the correct pace when trained to beat of a familiar song. Take time to research songs that fall in the 100-120 beats per minute and find one you will easily remember during an emergency situation. Watch the 60 second demo video created by the American Heart Association to see Hands-Only CPR in action. Share it with the people that are important in your life. The American Heart Association has a full list of CPR, First Aid and Emergency Cardiovascular Care courses. Visit American Heart Association’s website to find out more about ways you can learn life-saving skills that may save the life of a loved one!